The myth that boys are doing better than girls in mathematics seems to be false. Girls love to receive a nice compliment but they usually don't know how to react to it. Knowing how to draw girls is, in my opinion, a very good challenge for anyone. With so many curves to draw, it's easy to make mistakes or sketch some characters without real personality. 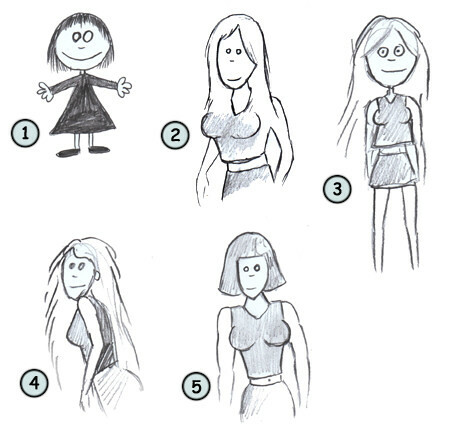 Girls have long short or long hair (1), a delicate neck (2) with tiny shoulders, breasts (3) and a small waist. (4). They also have long legs (6) and thin arms (5). They usually have larger hips than men. Overall, a woman will have delicate and thin body parts with lots of curves to practice on! If you pay attention to the image on your left, you will notice that the body of the woman could be split in two triangles. One that will form the shoulders right through the waist and another one from the waist to the hips. The arms are really thin, just like the legs. The breast should be placed somewhere in the middle of the first triangle. In this case, the neck is not too long and not too large. Let's see how we could draw a cute cartoon girl! First, draw a circle for the head and two triangles to form the body. Next, add some legs to make sure you have all proportions right. Then, draw a better outline of the body of your character by adding the breast and the waist. When you are done, add the arms. Finally, draw the hair, all details in the face and the feet. Here you go! A nice looking cartoon girl! Girls can come in many shapes. You can always try to draw one that is more simple (1) or another one with more realistic attributes (5). Don't hesitate to experiment. Look around you. Find models and practice with them. The more you draw, the easier it will be to draw a nice simple cartoon girl!